Angrand’s preference was for rural subject matter inspired by time spent away from Paris in his native Normandy – a passion shared with Camille Pissarro, who had moved to the Norman village of Eragny – but here the horizon shows that urbanisation has encroached on this part of the River Seine. Angrand was a devoté of the work of Jean-François Millet whose influence can be discerned in The Seine at Dawn – like the earlier master, Angrand is primarily concerned here with the creation of a strong atmosphere of quietude and introspection. 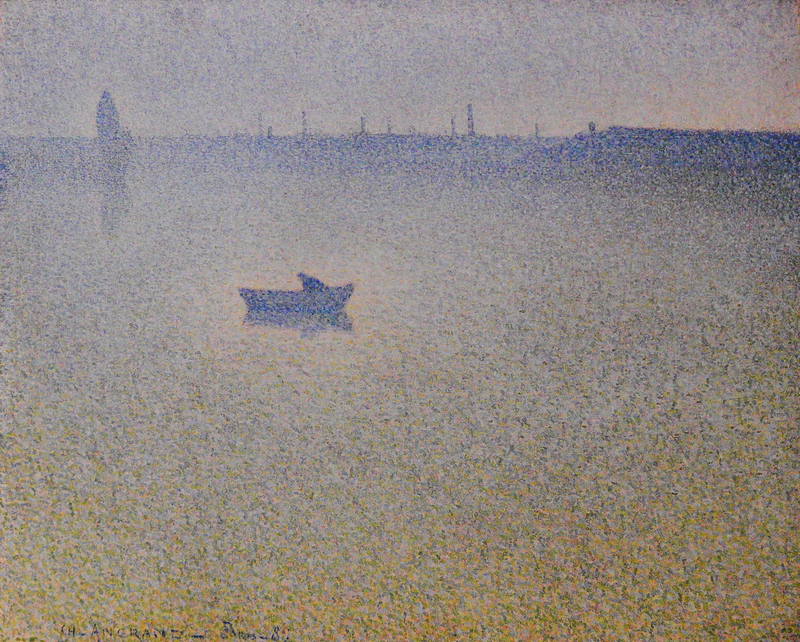 In a similar fashion to Seurat’s last ’Marines’ Angrand strips away content, creating a vast expanse of water (accentuated by a high horizon line) broken only by the solitary boat, enveloped in a corona of cream and light green thus adhering to Neo-Impressionist colour theory and also accentuating the craft’s isolation. The artist referred to this painting in a letter as a ‘symphony in grey’ showing that he was aware of Whistler’s use of musical allusions in his titles. This painting deserves a place beside Whistler’s Nocturnes as a beautiful evocation of peace and tranquility.